The 2017-18 NHL season was full of surprises. There was perhaps no better example than a Western Conference finals matchup that featured the Golden Knights, a team that had not played a single game prior to the season, and the Jets, a team that had missed the playoffs the previous two years and had never in its existence won a single playoff game. Vegas’ success was a sensational story because of the sheer improbability of it all. There were some lightning-in-a-bottle elements to it (Marc-Andre Fleury’s career year; William Karlsson coming out of nowhere to score 43 goals; pretty much everything going their way), which leaves some skepticism that the success will be repeatable in Year 2. For now, though, let’s focus on the Jets, because while their postseason run was not quite as improbable as the expansion Golden Knights, it still came out of nowhere. Just consider where they started. Before 2017-18, the franchise (in both Atlanta and Winnipeg) had made the playoffs just two times in 17 seasons. In both instances, it was swept out of the playoffs in four straight games. In its first six seasons in Winnipeg, it won more games than it had lost just twice and had topped 87 points in a season just one time. Then it came out this past season and stormed to the top of the NHL standings with the league’s second-best record, finishing a couple of wins short of the Stanley Cup Final. The success, given the historical performance of the team on the ice, was a huge surprise. Despite the surprise element of it all, this is still a ridiculously talented team that should be set up for long-term success — provided they get a few things right. In terms of roster moves, the offseason has been remarkably quiet for the Jets, and that is nothing out of the ordinary. General manager Kevin Cheveldayoff is notoriously patient with his roster construction and typically shies away from making big moves, instead opting to build the team from within. The one big exception to that was the trade for Paul Stastny at the trade deadline. Stastny was a fantastic addition and made a huge impact in the playoffs, but the Jets were not able to re-sign him as he ended up leaving for the Vegas team that eliminated the Jets in the playoffs. Stastny’s loss hurts, but it is not a crippling blow to the team. He was a luxury. An outstanding luxury, but they were a contender before acquiring him and they are still one after he exited in free agency. Let’s start with the area where the Jets are completely set in 2018-19. The foundation for this team is a collection of forwards that can be as dynamic as any other team in the league. Even when they missed the playoffs in 2016-17, it was never due to a lack of offense. 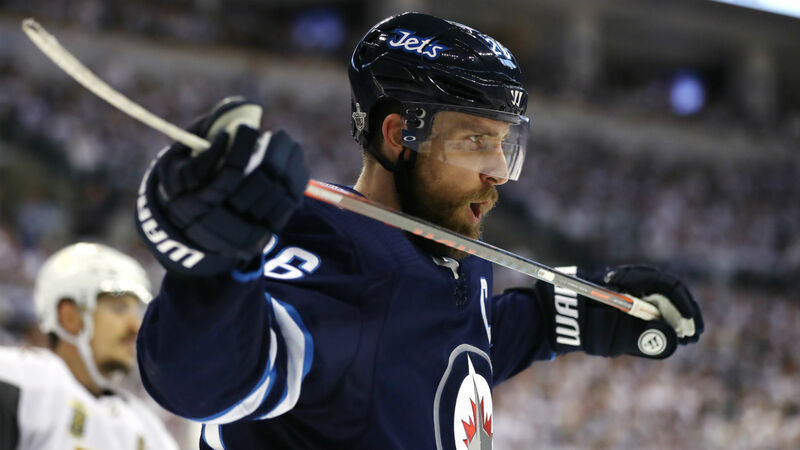 Blake Wheeler has been one of the NHL’s most underrated forwards for years, and they have assembled a superb crop of young talent who have all developed into top-line players in Mark Schiefele, Nikolaj Ehlers, Kyle Connor and Patrik Laine, the best of them all. Four of Winnipeg’s top five scorers from this past season were 24 or younger, while three were 21 or younger. That, of course, means that they have probably not even fully hit the prime of their careers yet and played their best hockey. Scheifele and Ehlers are both already signed to long-term deals, while Laine and Connor will become restricted free agents after this season, in line for significant pay raises (Laine’s contract will be huge). Laine is the exact type of franchise player who teams lock up regardless of cost, and Connor is a perfect complement to the core. The Jets have the salary cap space to get all of them signed and should — should! — have no problem taking care of them. It is a matter of when, and not if, it happens. That leaves three pretty big questions that will determine whether the Jets can build on their success. The first is how they handle Wheeler’s contract situation. He will be eligible for unrestricted free agency after this season, and negotiations will be a very delicate matter. Wheeler’s importance in the short term can not be understated. He is the captain of the team. He was the leading scorer this past season with 91 points in 81 games. He has been one of the most productive scorers in the league for several years. The problem: He turns 32 this season and will be 33 when his next contract begins. Even with the salary cap continuing to increase, the Jets still have the aforementioned contract situations with Laine and Connor to deal with (and Laine will probably be in the $10 million range). Giving a long-term contract to a 33-year-old forward, no matter how good he is now, is going to carry some risk. That also might be a risk worth taking. The Jets are in the middle of what could be a window to seriously compete for a Stanley Cup in the coming years. You have to take advantage of that opportunity when it presents itself, and while Wheeler may not be a great value at age 37 or 38, he probably will not have his production fall off a cliff in the next few years. There is still a lot of high-level hockey to squeeze out of him and even if you assume that his production declines a bit in the coming seasons, it will still be better than what they could find to replace him on the open market or in a trade. The second issue: The Jets have to find some sort of a resolution to the Jacob Trouba contract situation. After a marathon five-hour arbitration hearing Trouba, was awarded a $5.5 million salary for the 2018-19 season, after which he will once again be a restricted free agent. Given the issues they have had working out contracts with him throughout his career — as well as the fact he already requested a trade out of Winnipeg once in his career — it seems like a split is inevitable. And that could be a problem. Trouba is not only an outstanding defenseman entering the prime of his career, he is one of the Jets’ best defenders and should be a critical part of the core going forward. While the Jets are overflowing with young talent at forward, their defense is a little older and not quite as set long term. Dustin Byfuglien is 33 years old. Tyler Myers is 28 and eligible for unrestricted free agency after this season. Josh Morrissey is pretty good. After that? There is a bit of a drop off and losing Trouba — even in a trade — would be a difficult blow to the team. Then there is Connor Hellebuyck. The one big move the Jets did make this offseason was committing a six-year, $37 million contract to their starting goalie. This move, perhaps more than any other, will dictate where the Jets go in both the short and long term. For years, the Jets’ biggest issue has been an unstable goaltending situation that consistently sunk the team down the standings and kept them out of the playoffs. In 2017-18, Hellebuyck finally helped stabilize the position with a performance that made him one of the finalists for the Vezina Trophy as the league’s top goalie. He earned the new contract and the significant raise. What can potentially make or break the Jets’ chances will be his ability to match that performance. For as good as Hellebuyck was this past season, it still seems like he is somewhat of a mystery. His AHL numbers were strong (.920-plus save percentage in two seasons), but his brief NHL track record has been a mixed bag with a strong debut performance in 2015-16, a bad performance in 2016-17, and a great one this past season. Which goalie is he? The Jets are paying for the 2017-18 version for the next six years. It is a gamble, but one the Jets pretty much had no choice but to take … and one that could end up paying off and giving them great value. Given what the Jets did this past season, they are not going to take anyone by surprise this season, and there is every reason to believe the success of this past season was not a fluke and that they should be right back in the mix in the Western Conference. How long that window stays open will depend on how the situations with Wheeler, Trouba and Hellebuyck play out.